The site at Tal-Wej has archaeological interest possibly dating back to Roman times. 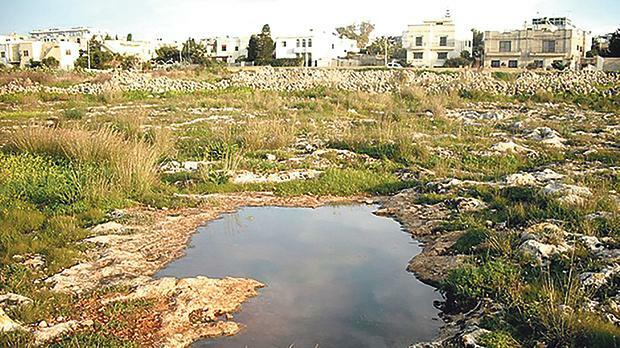 The Superintendence of Cultural Heritage and the Environment and Resources Authority are opposing the removal of soil from a Naxxar site, which has archaeological interest possibly dating back to Roman times. The public has until Friday (February 9) to make submissions to the Planning Authority on the proposal. The application is for the removal of soil for archaeological investigation in a 2,816 square metres site located outside the development zone in an area known as Tal-Wej. Last month the Archaeological Society Malta and Din l-Art Ħelwa insisted that the request should not even be considered. They backed up their appeal saying the development was being proposed on land which in 2011 was scheduled level two in view of its ecology, class A for its archaeology and is known to contain class B vine trenches which could date back to Roman times. They told the Times of Malta that an archaeological exploration of the Tal-Wej area was carried out in the 1980s. In view of this and the destructive nature of an archaeological excavation, there was no reason or outstanding research agenda making it necessary to revisit the site archaeologically. The Superintendence too is objecting to the development application and considers an archaeological investigation in this area as an “unnecessary and unjustified impact to the cultural heritage”. Recommending refusal, it urged the Planning Authority to implement its policies to ensure the protection of the natural and cultural landscape. According to the Superintendence, the area of Tal-Wej is a multi-period site with cultural heritage features dating from the Bronze Age. It said the shaping of the Tal-Wej area of archaeological importance through the interaction of humankind and its natural environment defined the area as an important cultural landscape. Among others, there were cart-ruts, dolmen, ancient quarries, rock-cut tombs, as well as more recent early modern structures such as a 16th century chapel dedicated to Santa Margherita, corbelled huts (giren) and agricultural trenches. The ERA also recommended refusal. The proposed intervention, involving the clearing of vegetation and soil removal, is objectionable from an environmental point of view as it will change physical features of the site, affecting mature carob and almond trees. There will also be additional encroachment onto nearby habitats, with consequent longer-term pressures leading to their degradation. “In addition, there are significant concerns that approval of this application would result in a pretext for future development ODZ in the remaining open space between the densely urbanised localities of Mosta and Naxxar,” the ERA said. And while the proposal indicated that the works were intended for archaeological investigation, the subsequent fate of the site upon conclusion of such investigations remained unclear, it added.